The Full Moon is Friday April 22 and is the smallest Full Moon this year. Jupiter is visible all night long . 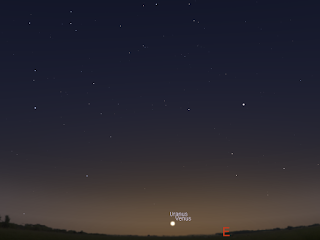 Venus is low above the horizon in the twilight. Saturn is close to the red star Antares and forms a triangle with Mars. 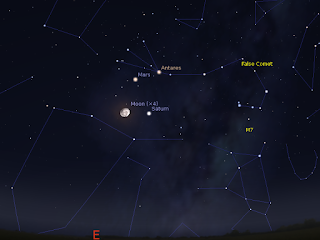 Mars is in retrograde motion and is visited by the Moon on the 24th. 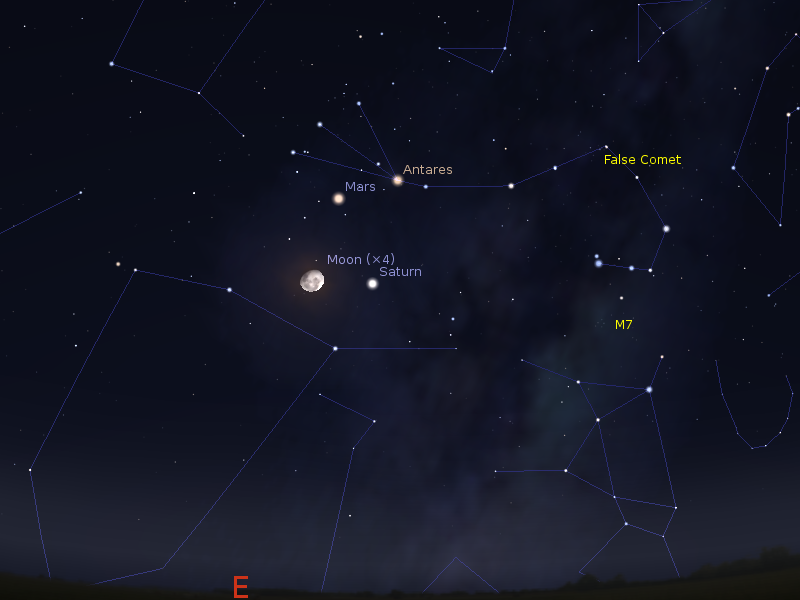 ANtares, Saturn and Mars are close to the Moon on the 25th. The Full Moon is Friday April 22. The Moon is at apogee on the 22nd, and this is the smallest Full Moon this year (a Mini-Moon). Evening sky on Thursday April 21 looking north-west as seen from Adelaide at 22:00 ACST. The inset is the telescopic view of Jupiter at this time. Similar views will be seen elsewhere in Australia at the equivalent local time. (click to embiggen). 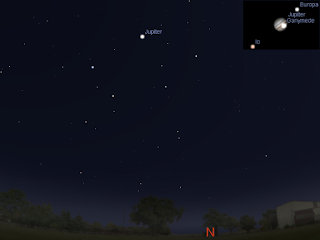 Jupiter enters the evening sky as the sun sets, and is good for telescopic observation from around 21:00 on. 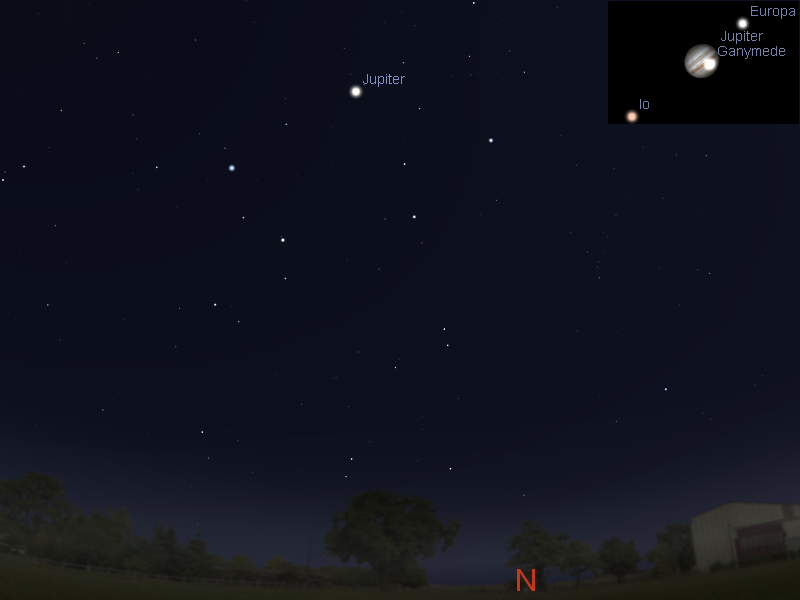 Jupiter's Moons will be an excellent sight late in the evening. On the 21st Ganymede transits Jupiter and Europa appears from eclipse. Evening sky on Monday April 25 looking east as seen from Adelaide at 22:00 ACST. Mars, Saturn and Antares form a triangle with the Moon nearby. Similar views will be seen elsewhere in Australia at the equivalent local time. (click to embiggen). Mars starts the week below the bright red star Antares in Scorpio. Mars forms a triangle with Saturn and the red star Antares. On the 24th and 25t the waxing Moon is near Mars. 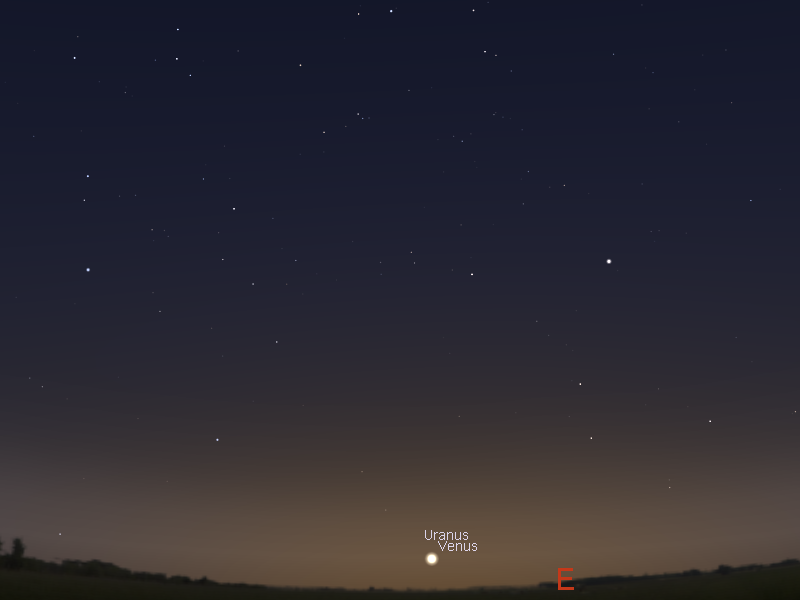 Saturn is low in the evening sky around midnight and is readily visible below Scorpius. Saturn forms a triangle with Mars and the red star Antares. On the 25th the Moon joins Mars, Saturn and Antares. Early morning sky on Sunday April 24 looking east as seen from Adelaide at 6:00 am ACST showing Venus low in the twilight. Similar views will be seen elsewhere in Australia at the equivalent local time. (click to embiggen).